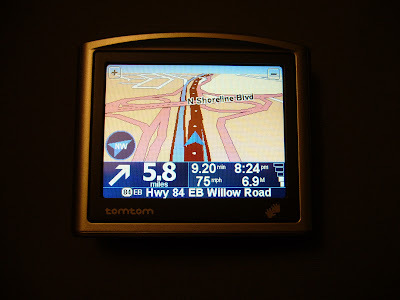 Igor Minar's Blog: TomTom One Caught Speeding! While writing my post about TomTom One, which I bought recently, I realized that the device is speeding! TomTom One has a feature that enables users to preview the route in a demo mode. TomTom previews the route and all the turns as if you were driving the car, while you sit in your chair. The interesting thing is that my TomTom was "driving" 75mph on the 101 freeway which has speed limited posted at 65mph - standard in the Silicon Valley!!! ...or it a bug. The question is where at TomTom software or map provider? I'll look into it tomorrow, if I have a time. Good observation, though!